Today, I’m going to take a quick look at my first Nendoroid More: Dress Up set, swimming wear! These were previously exclusive to events in Japan, but the most recent re-release was available on the Good Smile Shop worldwide. I got this particular set on my last visit to Tokyo. These Nendoroid More sets are usually sold in stores as individual blind boxes, but if you choose to buy an entire box of 6, you are guaranteed one of each type, including the secret figure not shown on the box. The Swimming Wear set has 5 regular types + 1 secret type, making a total of 6 different figures to collect. As stated by Good Smile Company, these figures do not come with any face or head parts. Each box contains an outfit with a neck joint and various accessories. I’ve chosen Miku to help model each outfit. For those interested, I’ve used the hair and face parts from Nendoroid #261: Hatsune Miku – Yukata Ver. and the face parts from Nendoroid #300: Hatsune Miku 2.0. The first outfit in the set is the typical swimwear students in Japan wear for swimming lessons during school. It comes with a yellow ball, two straight arms and two bent legs for sitting on the ball. All arms and legs are detachable and can be rotated around the joint/peg. These outfits come with a special clear, fixed-height stand that plugs into the back and holds the figure up. This one also comes with a sticker sheet for attaching a nameplate to the front of the swimsuit. There are a total of four nameplates. These are typically used at school to help teachers identify their students, so it was a nice addition to this figure. I didn’t use my stickers, but here is an example of it by Kaho-tan. The second outfit in the set is basically a colour variant of the first. The school swimsuit comes in the colour white, and the ball comes in blue instead. The arms and legs are identical, as well as the stand. As this is also a school swimsuit, four nameplate stickers are also included. In addition to two school swimsuits, the set comes with three bikinis. The first bikini comes in pink. This outfit also comes with an orange hibiscus flower hair accessory and a pink dotted beach mat. It also includes a clear, fixed stand with a shorter height to accommodate the sitting pose. The hibiscus comes with a plastic insert that you place between the front and back hair pieces. The third and final bikini is in blue, and it comes with a yellow hibiscus flower and a blue dotted beach mat. Last but not least, the secret figure in this set is a bath towel outfit! It comes with a wooden-like bath mat, and it features one arm bent over the chest. The arms are removable, but to my knowledge, the legs are not. It comes with a stand very similar to, if not the same as, the bikini figures. Unfortunately, there are no other accessories that come with this one. Removable arms and legs means you can mix and match them between all the figures in this set; however, I’ve found that the legs are not a 100% perfect fit when switched between the school swimsuit and the bikinis. You will definitely notice slight gaps. I was able to swap out the arms with no problems, but the hole and peg for the legs on these figures are definitely smaller than that of regular Nendoroids, making it very hard to attach them unless extra force is used. Even then, I worry about widening the hole too much and causing the original legs to become loose in the future. What do you guys think of this set? Does anyone have any of them? Have you tried swapping out parts with your other Nendoroids? Please share your comments below! ^▽^*)/ Thanks so much for reading, and see you next time! 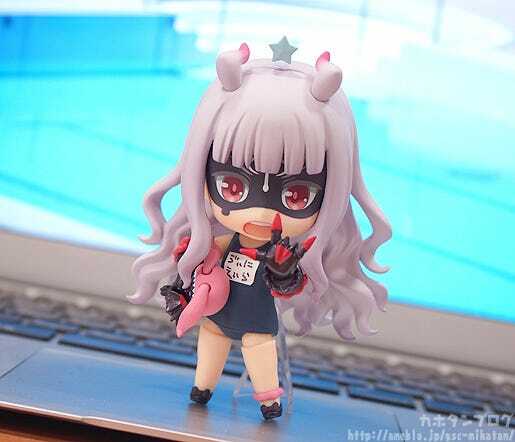 Posted in Nendoroid Reviews, Nendoroids, Reviews, UncategorizedTagged hatsune miku, nendoroid, nendoroid more, review, swimwearBookmark the permalink. I have pink and blue bikinis but I had no ideia that parts could be swapped.